The shortlist of finalists for the Middlesex Golf Awards 2019 has been announced today. 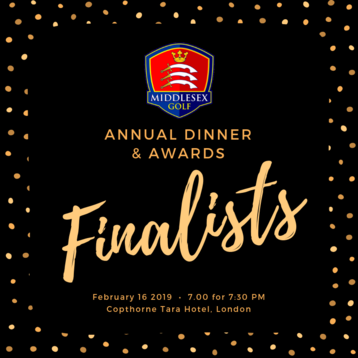 The finalists have been selected by the judging panel from a large number of entries which highlights the fantastic achievements by clubs, volunteers, and staff in Middlesex. The winners will be announced on 16 February 2019 at the Annual Dinner and Awards at the Copthorne Tara Hotel, London. Tickets for the event are just £55 each and include drinks on arrival, a three-course dinner with half a bottle of wine per person. To book, please contact County Secretary, Jason Mitchell, at secretary@middlesexgolf.co.uk.